If you have created “normal” WCF service projects in the past you will probably be used to being able to click “Discover” in the “Add Service Reference” dialog. Unfortunately, because we’re not using a standard project, we have to do a little bit of work ourselves to get the references added. Please see the original article for information on how we setup the project initially, and some Vista specific settings. Other than renaming the namespace (remembering to change the App.Config system.ServiceModel section to point to the new namespace) our server project remains the same as before. We will add a very simple WCF service that adds 2 numbers together and returns the result to the client. This will add an interface to our project (IAddingService.cs), and a concrete class that implements it (AddingService.cs). It will also add a lot of configuration information into our app.config which we will talk about later. If you open the interface file you will see the class and default method decorated with attributes to signify they are WCF “Contracts”. The ServiceContract attribute signifies that a particular class or interface defines a service contract for WCF, the OperationContract attribute is applied to a method to signify it’s an operation in the service (i.e. it’s a callable method), and the DataContract attribute is used to expose custom data types via the service. For this demonstration we will use a single ServiceContract containing a single OperationContract. If you now open our App.Config you’ll notice a whole raft of changes that Visual Studio has added for us. The majority of what is added is beyond the scope of this article, the only part we need to worry about for this quick demonstration is the newly added service tag. We will stick to wsHttpBinding for this demo, so we can remove the mex binding line. We will also change the default baseAddress to listen on the same port as our ADO.Net Data Servics service (but on a different url). 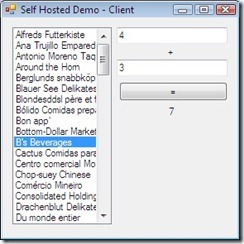 Ok, now the server is finished we will add another WinForms application to serve as our client. Once the new project is added we need to add the Service References to point to our two services. Once that’s done we can close down our server app for now. It’s worth noting that if you alter the service and want to update the client reference then you need to go through the same process of firing up the server app before you choose Update Service Reference. Creating our Data Services service requires us to pass in a Uri to locate the service. We would normally store this in a configuration file somewhere, but for ease of reading it is just hard coded in this demo. 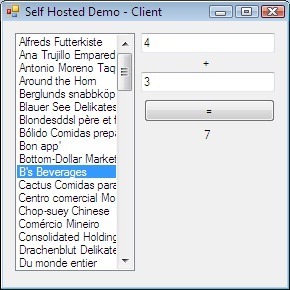 That should look very familiar to anyone that had data bound a WinForms control before 🙂 We could use LINQ to filter the list and do other fancy things, but we’ll stick to the full list for this demo. Again, in a real world app we would probably put the call to the web service in a background thread and update the UI with a Dispatcher. 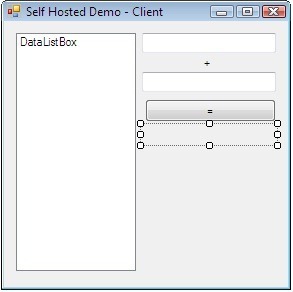 Tagged with ADO.Net, ado.net data services, astoria, self hosting, wcf. 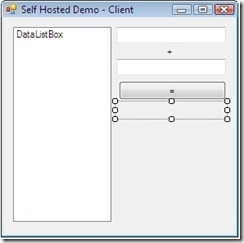 This is not a ADO.NET Data Service. 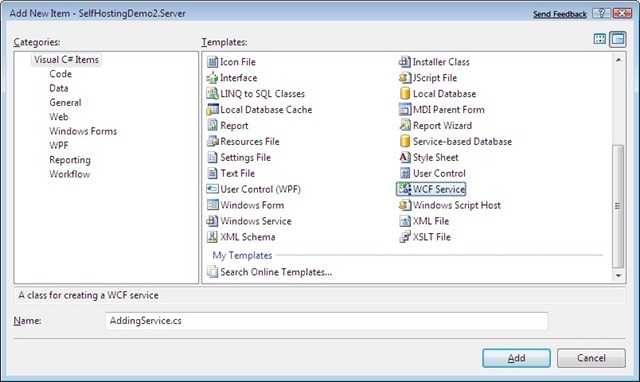 A Data Service would derive from DataService and would be hosted by a instance of DataServiceHost. If you actually bothered to read the article (or even just the title!) you’d see that this is Part II that extends the DataService sample (from the previous article) with a WCF service.